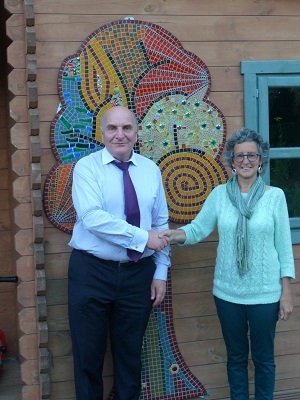 I was delighted to have worked in partnership with Vivien Dymock of the Log Cabin on a 2 year mosaic art project. This had been a strong community project with different people involved including the children and young people, staff, local business and volunteers. The project was to design and create several large cut out mosaics to go into the playground at the Log Cabin, a children’s charity in west London. Working with the children on a weekly basis, we made 11 outdoor mosaics including a butterfly, dragonfly and glitter stepping stones as well as 2 seven foot high trees! 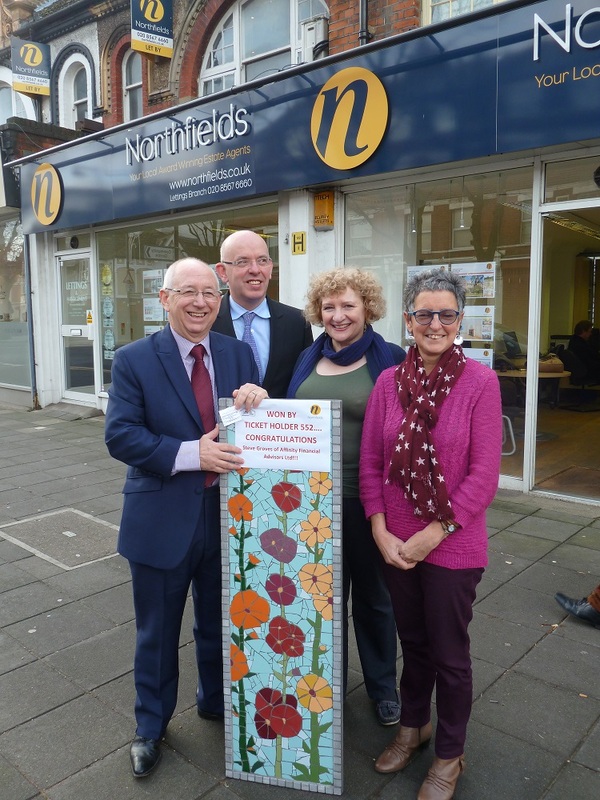 Another large mosaic called ‘Hollyhocks’ was raffled at £1 per ticket and raised £1,250 which was spent on art materials for the children. With regular coverage from local press, word of mouth and ‘friendly persuasion’, 95% of mosaic materials were donated by small business as well as monetary and time donations from friends. In addition, a group of gardening friends volunteered to design and create sensory garden beds. Soil and plants were purchased with a very generous discount. After a year of planning, digging and planting there are now 3 beautiful and vibrant sensory beds which enhance the playground and mosaics. See the Gallery of photos from the project.See the List Of Volunteers, Helpers and Donors.See The Log Cabin Project Blog.